Crystal Stewart has long been interested in commercial and consumer horticulture. She completed both her bachelor and master degrees at the University of Wisconsin. During her studies, she worked in the Department of Horticulture as a Graduate Teaching Assistant and as a Research Associate. After graduating, Crystal became a Regional Extension Educator with the South Dakota State University Cooperative Extension providing horticulture support. 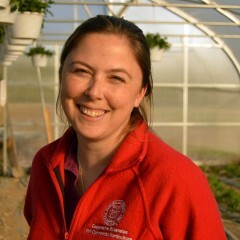 She joined Cornell Cooperative Extension in 2007 as the horticulture and agriculture educator in Fulton and Montgomery Counties. Today, Crystal's areas of emphasis include organic horticulture, small and beginning farmers assistance, and basic farm business management.